Important Note: Unlike solar eclipses, which cannot be safely viewed without very dark filters of special manufacture, lunar eclipses are perfectly safe to look at without any filters, as the moon is never bright enough to pose any danger to your vision. Some full moons are slightly closer to us (as is the one on Sep 27/28, 2015) and therefore look a little bigger and brighter than usual, and others are slightly further from us and therefore look a little smaller and fainter than usual, but all full moons are roughly the same brightness, regardless of whether they involve eclipses or not. When Does The Eclipse Take Place Where You Are? As discussed on the page about The Motion of the Moon, the Moon moves around the Earth once every 27.3 days, but because of the Earth's motion around the Sun during that time, it takes about 29 1/2 days for it to gain a full lap on the eastward motion of the Sun caused by the Earth's orbital motion. Twice during that time the Earth, Moon and Sun are more or less aligned: at new moon, when the Moon is between the Earth and Sun, and at full moon, when the Earth is between the Moon and Sun. Usually when this happens, the approximately 5 degree tilt of the Moon's orbit relative to the orbital path of the Earth and Moon around the Sun causes the Moon to pass above or below the Sun (at new moon), or above or below the shadow of the Earth (at full moon). But during an approximately 40-day long period centered on the direction in space where the plane of the Moon's orbit crosses the plane of the Ecliptic (the Sun's apparent path in the sky as a result of our annual motion around it), the Moon is too close to the Ecliptic to pass above or below the Sun or the Earth's shadow, and we have eclipses of the Sun or Moon. There are two such 40-day periods during a roughly 49-week period sometimes referred to as an eclipse year, separated from each other by half that time, and each such period is called an "eclipse season". Since these 40-day periods are longer than the 29 1/2 day cycle of lunar phases caused by its motion relative to the Sun, there will be at least one full moon (and one lunar eclipse) and at least one new moon (and one solar eclipse) during every eclipse season. Depending on the timing of the new or full moon relative to the middle of the eclipse season, we can also have an extra eclipse, with two lunar eclipses near the beginning and end of the season and a solar eclipse near the middle of the season, or two solar eclipses near the beginning and ending of the season and a lunar eclipse near the middle of the season. Also, since the cycle of two eclipse seasons is about 3 weeks shorter than a year, eclipse seasons come about three weeks earlier each year (though when eclipses occur during a season may be earlier or later than the previous year), so there are times when an eclipse season overlaps the start or end of a calendar year. Under those circumstances it is possible to have one extra lunar or solar eclipse at the beginning or ending of a year. As a result, every year there are at least two lunar eclipses and two solar eclipses, for a total of at least four eclipses, and in some years there can be as many as five eclipses of one sort and two of the other sort, for a total of seven eclipses (though that is much less common, occurring only once every nine years at most). Although there can be eclipses on a more or less regular basis each year, there are different kinds of eclipses, and their visibility can vary greatly. Lunar eclipses are at least partially visible on more than half the Earth (the half that is facing the Moon at the middle of the eclipse, plus a portion to the east and west of that half where only the start or the end of the eclipse is visible), while solar eclipses are visible on only a small portion of the half of the Earth facing the Sun during the eclipse, especially if we consider total or annular eclipses, which are visible on only a fraction of 1% of the sunward half of the Earth. Aside from the question of where an eclipse can be visible at all, there are different kinds of eclipses. We divide lunar eclipses into total, in which all of the Moon is at least temporarily in the umbra, or darkest portion of the Earth's shadow, partial, in which only part of the Moon is ever covered by the umbra, and penumbral, in which none of the Moon passes through the umbra, but only through the considerably less dark outer portion of the Earth's shadow. 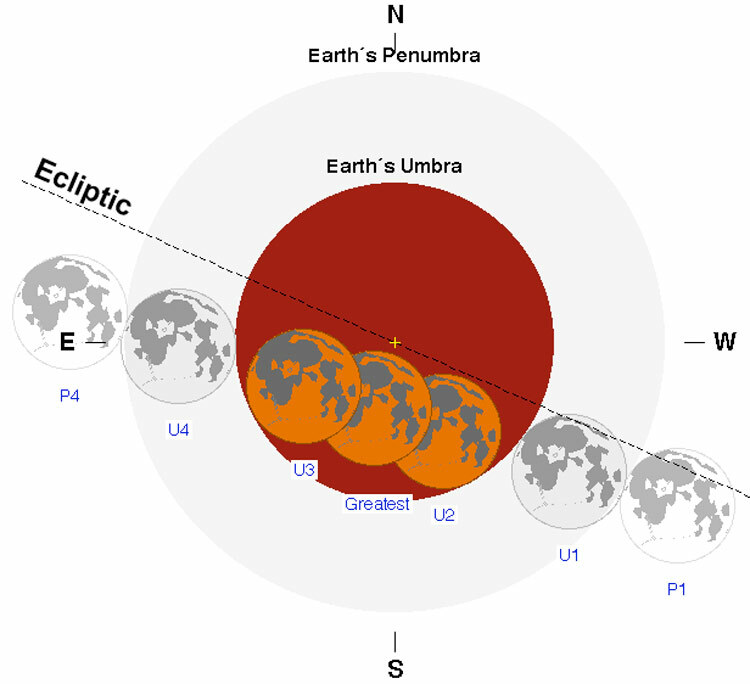 In general, penumbral eclipses are hard to notice unless at least part of the Moon passes very close to the umbra of the Earth's shadow, in which case a slight darkening of that part of the Moon may be observed. However, partial eclipses can be easily seen, as the part of the Moon in the umbra is so well hidden from the light of the Sun that it appears almost completely black in comparison to the brightly lit portions of the full moon that are not in the umbra; and total eclipses are also easy to see, since the entire Moon is covered by the darkest part of the Earth's shadow. One oddity about total eclipses is that once the whole Moon is covered by the umbra, the Moon becomes relatively easy to see, though it is much darker than usual, and in general a brownish, reddish or orangish color, depending on how close it is to the center of the umbra, and whether there is extensive cloud cover in the ring of air surrounding the Earth as seen from the Moon at the time of the eclipse. When only part of the Moon is inside the umbra (during the partial part of the eclipse), the contrast between the brightly lit portion of the full moon that is not in the umbra makes the part of the Moon that is in the umbra too dark to see; but once all of the Moon is in the umbra, and the bright light of the full moon is completely eclipsed, it becomes easy to see that it is still lit by sunlight shining through the ring of air surrounding the Earth. Above, an image of the Earth's inner darker shadow (the umbra) and its outer lighter shadow (the penumbra). As shown on the page about Lunar Eclipses, if something is in the penumbra it can see the Earth blocking part but not all of the Sun, so it still looks almost as bright as if it were not in shadow at all; but if something is in the umbra it sees the Earth blocking all of the Sun, and the only light reaching it is sunlight streaming through the atmosphere surrounding the Earth, which is only a tiny fraction of the light that even a small glimpse of the actual Sun can provide. In addition, because that light is passing through regions in the atmosphere where the Sun is rising or setting it looks reddish, just as the Sun and Moon look reddish when rising or setting, because dust and haze in our atmosphere filter out the shorter wavelengths of light. As can be seen in the image above, during the eclipse of Sep 27-28, 2015 the Moon's path lies slightly below the Ecliptic, the path followed by the Sun during the course of the year as a result of our orbital motion around it. The shadow of the Earth is centered exactly opposite the position of the Sun, and since the Sun is always on the Ecliptic (that being defined as its path), the center of our shadow also lies exactly on the Ecliptic, at the point marked by a plus sign. Throughout the month, and as a result also throughout the eclipse, the Moon is moving to the east along its own path at a rate of about one lunar diameter per hour. It moves a little faster when it is closer to us, which it happens to be during this eclipse, but it looks bigger at such times (which is why some people refer to it as a "supermoon", but it is just as close as this at some time every month, so the fact that it happens to be closest to us near full moon is merely a coincidence). Since it moves faster when it looks bigger the amount of time it takes to cover one diameter doesn't change very much, and an approximate rate of one diameter per hour is as good an approximation at one time of the month as at any other. At some moment the Moon's eastern rim touches the western rim of the penumbra; in eclipse parlance, this position and time are referred to by the symbol P1, meaning the first position involving the Moon's relationship to the penumbra, or outer shadow of the Earth. As it moves into the penumbra and its eastern rim gets closer to the umbra, someone on the Moon would see the Earth moving in front of the Sun, partially covering it, so that it doesn't look as bright as normal; but even when it is only five or ten percent as bright as normal it is still much brighter than any other object in the night-time sky, so it is difficult to notice that the eastern rim of the Moon is gradually getting a little darker until it is very close to the umbra. The period during which part or all of the Moon is in the penumbra but none of it is in the umbra is referred to as a penumbral eclipse, or as a penumbral phase of the overall eclipse. In most eclipses of the Moon there is a time when the entire Moon is inside the penumbra, but the eastern rim has not yet reached the umbra; that position and time is indicated as P2. However, because this eclipse takes place near perigee (the closest point in the Moon's orbit to the Earth), the Moon looks larger than usual (not enough to notice unless you do very careful measurements), and as a result looks too large to fit between the outer rim of the penumbra and the outer rim of the umbra; so there is no P2 position or time for this eclipse. At some point, usually close to an hour after the eastern rim of the Moon enters the penumbra, it reaches the outer rim of the umbra. That position and moment are referred to as U1. At that precise instant the eastern rim of the Moon looks a little darker than usual, but that is all we can notice. However, as time passes and the Moon continues to move eastward, its eastern regions move into the umbra. Once there they see the Earth completely blocking the image of the Sun and are only lit by the faint reddish light passing through the ring of atmosphere around the rim of the Earth as seen from the Moon. Since that light is so much fainter than the normal light of the Sun, the contrast between the regions in the umbra and the regions still in the penumbra is very high, and if your eyes are properly adjusted to the brilliant light of the still nearly fully lit Moon, the darker regions within the umbra will be too faint to see at all, so it looks like there is a completely dark chip cut out of the side of the Moon. The period during which part of the Moon is in the umbra but not all of it is in the umbra is referred to as a partial eclipse, or as a partial phase of the overal eclipse. Over a period of roughly an hour the Moon moves another diameter to the east, and at some point and moment (designated U2) all of the Moon lies inside the umbra. At that point none of the Moon sees the actual disk of the Sun, so the high contrast between such regions and the regions in the umbra no longer exists, and our eyes can adjust to the much fainter light falling on the Moon while it is in the umbra. That light is reddish, so depending on how bright or faint it is, various parts of the Moon may appear to be brown, brick red, or orange. Parts of the Moon that are close to the outer rim of the umbra see the atmosphere of the Earth much more brightly lit by the light of the rising or setting Sun, and look a brighter, more orange color. Parts of the Moon that are close to the center of the umbra see the atmosphere of the Earth more faintly lit by the light of the rising or setting Sun, and look darker. On rare occasions, when the atmosphere in the ring around the Earth (as seen from the Moon) is full of clouds, haze or dust the Moon may become to faint to see at all (I vividly remember being unable to see the totally eclipsed Moon during such a rare eclipse in the 1960's, even though it was 50 years ago). However, that will not happen at this eclipse, no matter how dusty or hazy our atmosphere is, because as shown in the image the Moon will pass well below the center of the umbra, and as a result will be more brightly lit than usual. The time during which all of the Moon is in the umbra is the total phase of the eclipse. If the Moon spends even a few minutes completely in the umbra (as it did in April 2015), the lunar eclipse is referred to as a total eclipse. If there is no time when all of the Moon is in the umbra, but even a few minutes when at least some of the Moon is in the umbra, it is called a partial eclipse. If none of the Moon ever enters the umbra, but some part of it passes through the penumbra, it is a penumbral eclipse. At some point, having crossed from one side of the umbra to the other, the eastern rim of the Moon reaches the eastern rim of the umbra and it begins to leave the umbra. This point and moment are referred to as U3, and the time between U2 and U3 is called the duration of the total eclipse. For the eclipse of Sep 27 - 28, 2015, that duration is 1 hour 11 minutes and 55 seconds. As the Moon continues its eastward motion, all of it gradually leaves the umbra, causing a second partial phase. The end of that partial phase occurs when the western rim of the Moon reaches the eastern rim of the umbra, and that position and moment are referred to as U4. The time between U1, when the eastern rim of the Moon enters the western side of the umbra, and U4, when the western rim of the Moon leaves the eastern side of the umbra, is called the duration of the partial or umbral phase of the eclipse. For the eclipse of Sep 27 - 28, 2015, that duration is 3 hours 19 minutes and 52 seconds. As in the case of P2, which represents the time when all of the Moon is in the penumbra of the Earth but none of it is in the umbra, but which does not occur in this eclipse because the larger than usual apparent size of the Moon (caused by its being very close to perigee) makes it too large to entirely fit into the penumbra, so there is no P2, similarly there would normally be a P3 analogous to P2 but on the eastern side of the Moon, but just as there is no P2 for this eclipse, there is also no P3. Finally, about an hour after U4, the entire Moon has left the penumbra, and at P4 we have a position and moment when the eclipse is entirely over. The time between P1 and P4 is called the duration of the penumbral phase of the eclipse, and for the eclipse of Sep 27 - 28, 2015, that duration is 5 hours 10 minutes 41 seconds. Note that the three eclipse durations just discussed are shown to the lower left of the image showing the motion of the Moon in the modified NASA image. As noted above, the NASA animation above, although it shows the basic ideas discussed above, is a terrible representation of the actual appearance on several counts, and if I had time I would replace it with a better one; but I promised to finish this page on the evening of the 26th/27th of September, so that people could refer to it before the eclipse the next evening, and it is already nearly midnight (this being one of the last parts of the discussion that I addressed), so I don't have time to find anything better. However, you can see that as the Moon passes through the penumbra and nears the umbra the eastern side does get a little darker, and once it is inside the umbra, it seems to be more a reddish-brown or orange in color. The worst problem is that (1) during the part of the eclipse where part of the Moon is in the umbra and part is in the penumbra, the part in the umbra should be shown as completely black, as it is far too faint to see the colored image used in the animation (the NASA artists having been incredibly lazy in creating the animation), (2) the Moon should be shown far brighter while in the penumbra, and the darkening near the umbra should be much harder to notice, and (3) the animation is so rushed that it is hard to see what is going on without watching it several times (which is why I changed its settings so that it repeats forever, instead of only being shown once or twice). Still, it gives at least some (even if a poor) idea of what things will look like, so it is (hopefully) better than nothing. The eclipse takes place at a particular moment in time, but because different parts of the Earth are in different time zones, the local time is different, depending on where you live. In the modified NASA image at the very top, the times for P1, U1, U2, U3, U4 and P4 are all shown in GMT (Greenwich Mean Time), or UT (Universal Time). Even in England, since they are currently on summer time, the actual clock time is different from that; but in the United States (where most of those reading this reside) you have to subtract several hours from the UT to find the local time. For Eastern Daylight Time, the subtraction is 4 hours, making the time of totality (as shown to the lower left of the image of the eclipse in the modified NASA image) 10:11 to 11:23 pm on the evening of the 27th. For Pacific Daylight Time, the subtraction is 7 hours, making the time of totality 10:11 to 11:23 pm PDT. 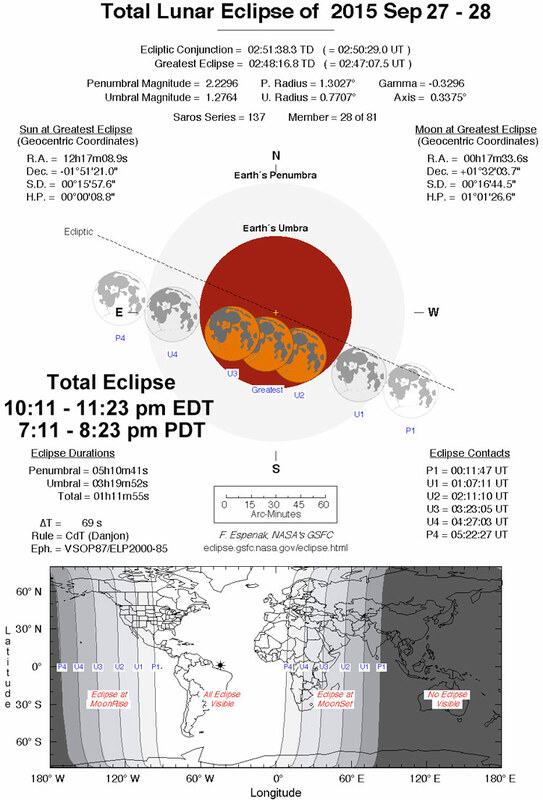 The UT for each of the six "contacts" is shown to the lower right of the image of the eclipse path, for those who wish to calculate the times for the start and end of the various phases (penumbral and partial, as well as total). Note: The last part of this discussion (below) was the first part I wrote, so it repeats some of the material above. But since I need to post this page as soon as possible, rather than rewrite the whole thing (as there is nothing wrong with it save for that repetition), I have decided to leave it as is for now, and edit and to a certain extent enlarge upon it at a later date, to deal with a few items shown in the modified NASA image at the top that I have ignored as being of little interest to most people, and therefore not worth taking the time to deal with right now. However, if you have any questions that this page and the page about lunar eclipses have not addressed, please feel free to use my contact information to ask them. Now let's consider the eclipse noted at the top of this page, the total lunar eclipse of Sep 27 - 28, 2015. The image shown there gives a tremendous amount of information, some of which is of little interest to the average observer, and some of which is critical. One topic of importance is, will the eclipse be visible where you are located? That is shown by the map at the bottom of the NASA image, which is shown (slightly enlarged) immediately below. As an aid in the discussion, I have added horizontal red lines to define various areas, and some extra labels. 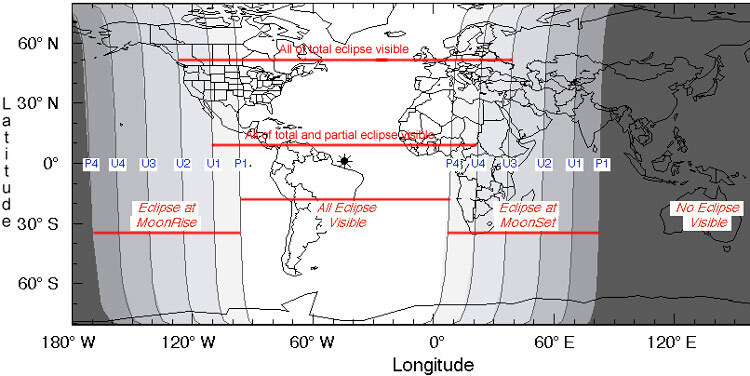 The dark regions at far right and left are on the day side of the Earth during the eclipse, facing away from the Moon, so they cannot see any of the eclipse. The white region in the center is facing the Moon throughout the eclipse, and can see all of it, including the penumbral stages when none of the Moon is in the umbra of the Earth's shadow, and telling that there is an eclipse is difficult or impossible. The shaded regions between the dark region on the right and the white region in the center are where the eclipse takes place near moonset, and only part of the eclipse is visible. The shaded regions between the dark region on the left and the white region in the center are where the eclipse takes place near moonrise, and only part of the eclipse is visible. The regions between the nearly vertical line marked U4 on the right and the one marked U1 on the left miss at least part of the penumbral phase of the eclipse, but can see all of the partial and total eclipse. The regions between the nearly vertical line marked U3 on the right and the one marked U2 on the left miss at least part of the penumbral and partial phases, but can see all of the total eclipse. Moving from right to left (that is, from east to west), the far right portion shown very dark is, as shown by its label, part of the sunlit regions where none of the lunar eclipse is visible. To its left is a nearly vertical curve labeled P1, and to the left of the area with the white background near the middle of the image, there is another nearly vertical curve labeled P1. The region between those two curves represents the half of the Earth facing the Moon at the time that the Moon first starts to enter the penumbra of the Earth's shadow. At that time no one would notice anything going on, because none of the Moon is yet covered by any of the Earth's shadow, but while the Earth rotates to the east the Moon far more slowly moves eastward, into the penumbra of our shadow, and by the time that the furthest eastern portion of the Moon begins to enter the umbra (starting the partial phase of the eclipse), only the part of the Earth between the two curves labeled U1 is facing the Moon. People between the eastern lines marked P1 and U1 will be able to see part or all of the penumbral phase of the eclipse, but are not likely to notice anything, unless they are very close to the line marked U1 and the western sky is very clear. During the time corresponding to the regions between the lines marked U1 and U2 the Moon is moving into the umbra of the Earth's shadow, and is partially eclipsed. People between the eastern lines marked U1 and U2 will be able to see part or all of the partial phase of the eclipse, but none of the total phase, as the moon sets before that. During this and the final partial phase (after totality) the part of the Moon not in the umbra is brightly lit by sunlight, while the part in the umbra is barely lit by light passing through a thin ring of atmosphere surrounding the Earth, as seen from the Moon. The contrast between very brightly and barely lit regions is so great that normally only the lit portion is visible, and the part of the Moon in the umbra appears completely dark. During the time corresponding to the regions between the lines marked U2 and U3 the Moon is completely inside the umbra of the Earth's shadow, and totally eclipsed. Now that all of the Moon is in the umbra, there is no problem with the contrast between brightly and barely lit portions of the Moon, and all of the Moon is easily visible, though a dark brown, brick red or orange in color and much fainter than usual at full moon, because so little light passes through the ring of air around the Earth, in comparison with the sunlight that usually falls on the full moon. In fact, if the eclipse is relatively central (that is, the center of the Moon passes almost exactly through the center of the umbra) and there is a considerable amount of clouds or dust in the atmosphere, the Moon may be too faint to see at all. This is very unusual, though I remember the Moon apparently completely disappearing during a total lunar eclipse of that sort about 50 years ago. Normally, however, as already stated, the Moon is easily visible, though a relatively dark red shade of some sort; this is the source of the so-called "Blood Moon" appellation that is used by con artists, hoaxers and other villains to try to convince the gullible that the total lunar eclipse has anything to do with apocalyptic affairs on Earth. In reality, absolutely nothing happens to the Earth during total eclipses except that people living on it can see the Moon fully but very poorly lit. It is a very pretty and relatively uncommon occurrence, since eclipses can only take place during eclipse seasons, and some are only partial or penumbral eclipses, which are not as spectacular; but in any given decade there are on average close to ten total lunar eclipses, so they are not at all rare.